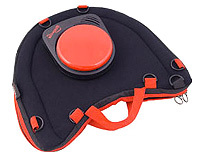 The following list details some of the mounts that can help players in their gaming. 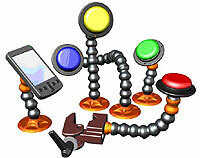 These can aid switch users to position their controls at the best angle for the part of body they are using. They can also help other gamers to better position things for their reach. Seek advice from the suppliers below and let them know what it is you are trying to achieve. Please feel free to e-mail for help if you have no luck with the following. 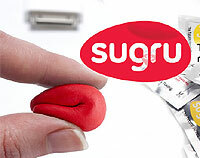 A range of well-priced and well designed velcro switch mounting solutions. 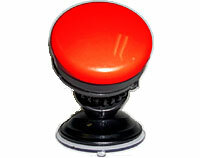 As used by OneSwitch and Special Effect. 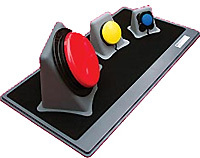 A range of highly versatile switch mounting solutions. These highly flexible mounts are amongst the safest to use by switch users with involuntary movments as they tend to give a litle if hit hard. Amongst the least expensive of mounting solutions. 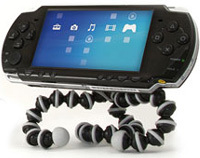 The Gorillapod Go-Go comes with a suction cup and adhesive stickers so should mount to almost anything. It may be wise to add your own velcro mounts to this item. Modular mounts, implementing a clamp / velcro base, magic-arm / arm and switch plate / device clamp can provide perfect solutions. Cheap D.I.Y. moutning methods exist and this excellent range of Enable Ireland YouTube videos are very useful. 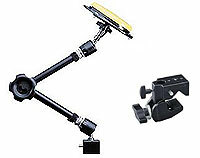 Some include Manfrotto, Daessy, Ram Mounts, Rehadapt, Mobilia and Mount'n Mover. 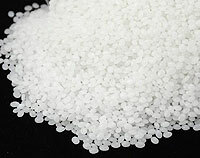 Plastic pellets that can be hand moulded into almost any shape once warmed up in water, then hard-set once they cool down again. 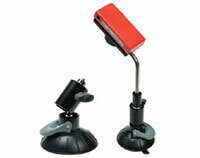 Some excellent and inexpensive options such as the Switch Poser for mounting switches and other assistive technology. 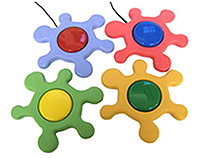 Non-slip switch holders, that come in a variety of funky colours. Excellent product. A rubber compound that sets in 24 hours. Lots of ideas for gaming in this link. Off the shelf soutions for mounting switches into the ideal position. A huge range to choose from. Laptop mount ideal for many wheelchair users. 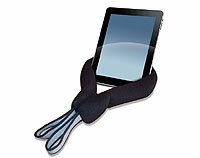 A portable and comfortable velcro surface ideal for placing switches. Media Mount for securing items onto a Trabasack tray. 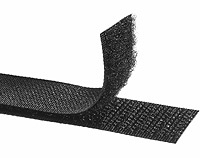 Industrial Strength velcro such as "TX9 Velcro" from Ability World makes semi-permanent fixings (may require industrial strength glue). Trabasack sell short lengths that come with two different strengths which are very useful and work great with Trabasacks..
Soft-touch system for avoiding hand cramps. 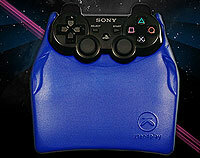 Versions for Playstation DualShock style controllers and Xbox 360 joypads. TLWMSN Blog - Kate Aherne's list including D.I.Y. ideas for low cost switch mounts. Also consider Foam, Polystyrene and small bean-bags or heat-packs. Mounts and More (UK) - specialise in mounting solutions as do their European partner TechCess Europe.